Shoes, while typically considered necessary, are still among one of the most versatile additions to almost any outfit. In fact, shoes can and will say anything and everything about an outfit or look from how they are styled to how well they match up. With such a diverse variety of shoes in dozens of different styles and colors, Dark Knight Armoury is prepared to offer you a pair of womens boots and shoes that will say exactly what you need it to say about your latest look. It does not matter what sort of style you are going for. Dark Knight Armoury has several options that will leave your head spinning. For a chic, modern look loaded with style and flair, many of our womens shoes or boots can be added to an everyday look to add that dash of personal character that you feel may be lacking. And if you need period footwear, we have those styles available as well. 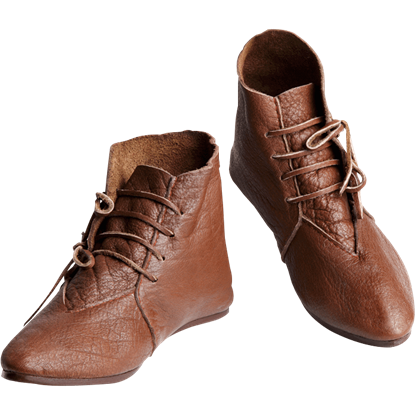 We have medieval flats and boots that work just as well for a warrior woman as they do for a princess or a fair maiden. 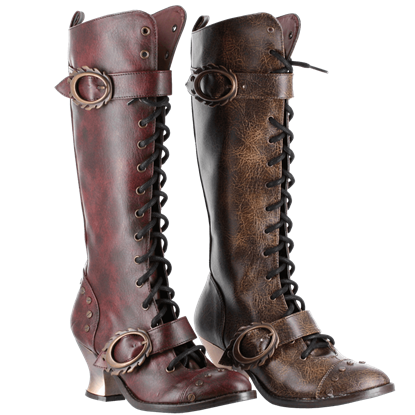 There are pirate boots for the lass on the high seas, gothic boots for the woman who likes that dark style, and Steampunk boots for that elegant lady who loves pseudo Victorian style fused with intriguing technology. Words simply do not do them justice. Take your time to browse through our womens boots and shoes, and you will see what we mean. One of the first things people tend to notice are your shoes. Make no exception with our 12th Century Leather Shoes. 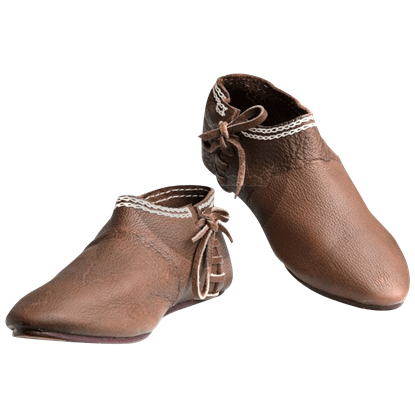 This leather shoe features side lacing for a customizable fit and they resemble footwear used during the Medieval ages. Okay, so you have the tunic, the belt, the leggings, and the cloak, but you haven't found the right shoes for your medieval outfit. Look no further, our 14th Century Laced Low Boots are exactly what you need for a stand out ensemble. More is usually a good thing. The Adler Buckled Steampunk Heel Boots are a unique accent that back up this notion, featuring a plethora of details that come together to have heads turning whenever you walk about in them! Steampunk style is filled with rich detailing, perfect for creating an eye-catching ensemble. These Alexandra Steampunk Boots are no different, as they transform knee-high boots with stunning Steampunk style. Style and class go hand in hand, especially when it comes to wearing a sleek and attractive pair of shoes. 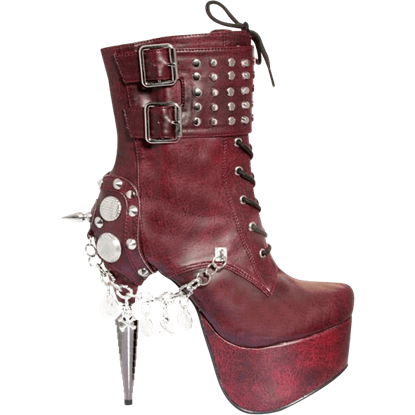 The Amina Steampunk Heels are just the ticket for a woman who wants something that is attractive yet subdued in style. Named after the queen of England and the second wife of Henry VIII, these Ana Bolena Steampunk Heels are a throwback to antique styling, possessing a rich look that makes them perfect for formal attire and Victorian costumes. The romantic elements of Victorian style meet spectacular fantasy in the Analia Lace Back Boots. Made of a soft faux suede, each shoe features charming satin lacing up the back and a chunky metal base covered in enchanting swirls. You might feel the urge to fight the dominance of the patriarchy when you wear these boots. The black, faux-leather Anarchy Knee High Boots boast a 4.5 inch heel and several silver buckle accents along their length. Step out in superb snakeskin style with the Aria Strappy Ankle Heels. These synthetic leather heels feature a snakeskin textured body with an open toe, three buckled ankle straps, and a funky prehistoric claw detail up the heel. Unlock something extravagant when you wear the Arianna Corset Clasp Knee High Boots. The decadence of a shimmering Victorian-inspired fabric decorates the front of each shoe while the leather back and toe lend sleek sophistication. These boots look tame from the front, but show their wild side in the back! The Arma Heavy Metal Biker Boots feature a 5-inch metallic claw heel. These fierce boots are available in three colors to go with Gothic or modern outfits. The Greek goddess Artemis was known as the protector of many things, including wild animals. Showcase your wild side in your wardrobe with these Artemis Gothic Heel Boots, designed to bring out the inner untamed goddess in you.